Troy Kleffner of Spalding won $25,000 a year for life playing Lucky for Life from the Nebraska Lottery. Kleffner purchased the winning ticket from Peoples Service of Spalding at 110 E St. Joseph Street in Spalding. The ticket matched five of the five winning numbers (07, 09, 14, 29, 31) but not the winning Lucky Ball number (08) from the March 25 drawing. Kleffner opted for the $390,000 lump sum instead of the $25,000 a year annuity. 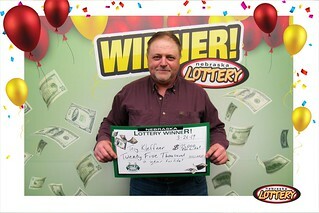 When he claimed his prize at the Nebraska Lottery offices in Lincoln on March 26, Kleffner said that he’s a regular player and purchased his tickets at the store run by his mother Connie Kleffner and right next to the tire shop he owns. Word spread quickly and people who worked at the businesses started calling him on Monday night, asking if he was the one. Kleffner said he’s planning on using some of his winnings to help with his kids’ college fund. Kleffner’s win was the biggest Lucky for Life win in Nebraska since the Nebraska Lottery began offering the Lotto game on August 20, 2017. Lucky for Life is a multi-state game currently offered by lotteries in 25 state and Washington, D.C. The odds of winning $25,000 a year for life playing Lucky for Life are 1 in 1,813,028, while the overall odds of winning any prize are 1 in 8.